As you well know, many people have been faced with an age old challenge that has rendered many irrelevant or ineffective in as far as realizing their dreams and expectations are concerned. In spite of having done all possible to change our status quo or general state of affairs (improve our situation) yet most are still on a plateau! They are not in the valley but neither are they in the mountain—just stuck in ’nowhere land’! Do you identify with this scenario? You see friend, I have been there too! It was in this ‘limbo’ that I asked the Lord according to James 1:5 to really show me why I and His people were seemingly ‘stuck’ and how to get out of this quagmire! On the 21st July 2006 God began to give me snippets of what was to later become the book soon to be published entitled “Your Destiny Unleashed!” and the accompanying television series entitled “Unleash Your Destiny!” However the Lord did not just give me this book, but he equally showed me an instruction manual that he directed to be shown and taught to His people so that they too may find a way out. Not simply to know their vision and purpose, but to also acquire a LIFE PLAN on how to progress through the process to the realization of their purpose. Thus has been created a workbook to accompany both the book and television series. The purpose of that workbook is to place in your hands—YOU! Yes indeed, a manual containing precisely who you are, what you believe in, why you are the way you are and most importantly, what your life mission and purpose is. Friend, with this workbook, you will know how to get there. I believe here in lies the answer to the challenge for us, the ‘how’ aspect of the process. As you know very well, you or someone you know may be facing the above mentioned challenges and failing to adapt. With your decision or help I believe this workbook can point you or those you know in the right direction and make them more effective in yielding results. It is with this in mind that I am proposing a one day LIFE PLAN seminar (10 hour session) which can be done virtually (online) or in person through personalized one-on-one sessions (very limited due to demand). If interested you can simply fill in the form below and click submit to receive a letter with all the details on how exactly you can get started. Unlike many seminars, this one is really a process of discovery as there is a lot of writing and self assessment involved. There is a fee associated with this event for two reasons, the first being that people will only value what they pay for, and secondly, personalized material will be provided for the course - downloadable. For an extra fee certificates of participation can be availed. · Elimination of negative influences hindering one’s progress. 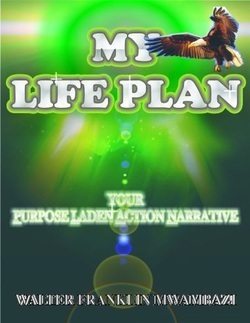 · The operation and mastering of key strategies that will set one toward financial prosperity and living 100% debt free! These and many more keys will be harnessed and honed out of the inner man and once crystallized, will set those who pursue relentlessly on a winning route to their destiny! If you do feel this seminar can have a positive and much needed impact in the lives of both yourself or those you know please fill in the form below and submit for further details. Please feel free to also indicate what you would like to achieve out of these sessions.